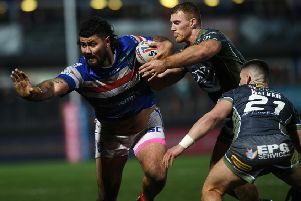 Head coach Brian Smith has named the Wakefield Trinity Wildcats’ 19-man squad ahead of the trip to Warrington Wolves on Friday (8pm). Nick Scruton and Anthony Walker replace Bill Tupou and Scott Anderson, who picked up an injury in last weekend’s win at Hull KR. Wildcats 19-man squad: Chris Annakin, Tinirau Arona, Joe Arundel, Matty Ashurst, Anthony England, Liam Finn, Craig Hall, Stuart Howarth, Ben Jones-Bishop, Tom Johnstone, Reece Lyne, Jacob Miller, Jon Molloy, Nick Scruton, Mickael Simon, Michael Sio, Anthony Tupou, Jason Walton, Anthony Walker.